Engineered Air offers an extensive line of hot water, chilled water and steam heating products for commercial, industrial and institutional application. As with all Engineered Air products our Heat Transfer Products can be customized to meet your specific needs. Engineered Air offers either copper or steel tube element to meet you finned tube radiation requirements. Our Galvanneal steel enclosure is treated with a multi-step Oakite Cryscoat preparation before being electrostatically painted with an epoxy powder coat prime finish. You then can choose from a variety of colours at minimal additional cost for your custom baked enamel finish coat. 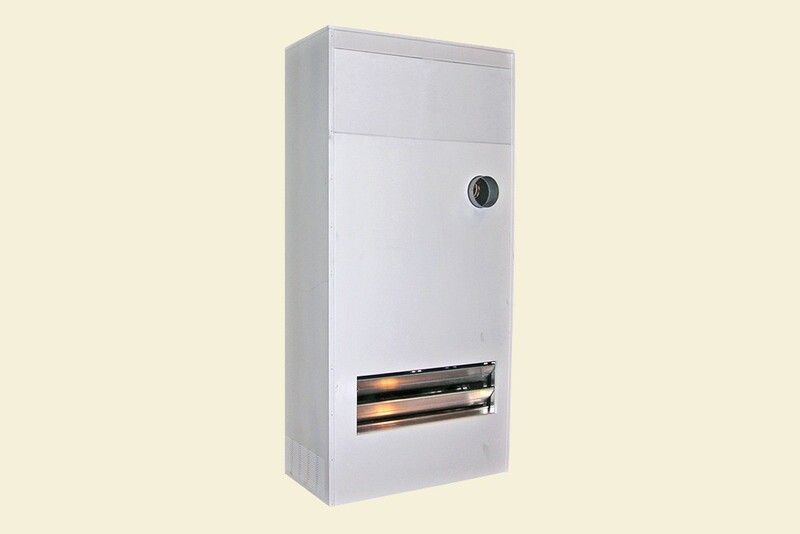 We offer a wide variety of enclosure styles as well as custom designed enclosure. Engineered Air standard enclosures are produced in the following styles: Slope Top (WF-1), Flat Top (WF-2) and Front Outlet (WF-3). Enclosure inlets can be supplied with Open Bottom (Type A), Slope Bottom (Type B) and Front Inlet Grille (Type C). Models are available in a variety of heights from 6” (152mm) to 36” (914mm) with lengths from 2’-0” (610mm) to 6 ’-0” (1829mm) increments. In addition to standard enclosures, Engineered Air can provide, upon request, custom designed models in a size, metal type, gauge and paint finish to suit any desired application. For ease of installation and design continuity, Engineered Air manufactures brackets, element hangers, joggle strips, end caps, inside and outside corners, laps, access doors, pilaster kits and manual dampers, manual dampers must be factory installed. The Engineered Air Profiles Series enclosure is produced in heights of either 8” (203mm) or 10” (254mm). The Profile Series enclosure is available in lengths from 2’-0” (610mm) to 7’ - 6” (2286mm) in 6” (152mm) increments. In addition to Profile Series enclosures, Engineered Air can provide, upon request, custom designed models in a size, metal type, gauge and paint finish to suit any desired application. Engineered Air manufactures the complete line of Horizontal and Vertical Unit Heaters with the following options: minimum 18 gauge (1.3mm) 304 Stainless Steel with Heresite coated coils and Totally Enclosed motors. The Stainless Steel Unit Heater is more than just great looks! 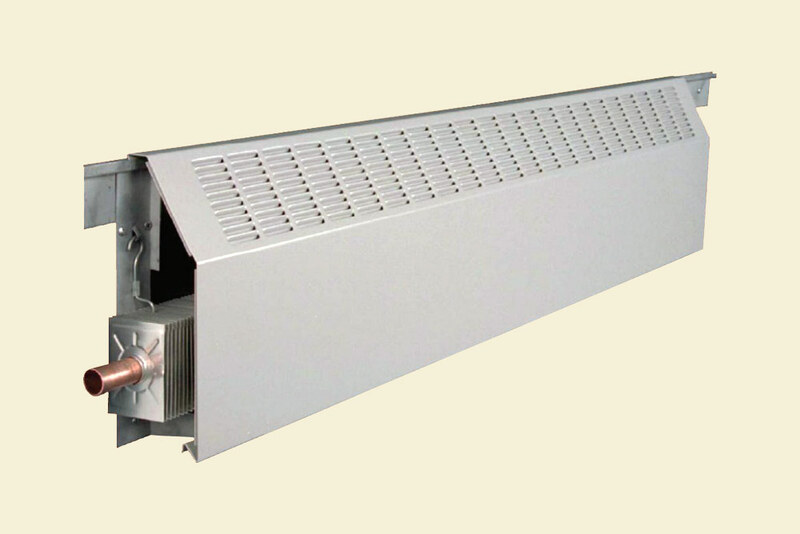 The Stainless Steel Horizontal and Vertical Unit Heaters meet a demand in the industry for corrosion resistant products. Built to meet the cleanliness requirements of this industry. Wash areas are one of the most corrosive environments, but are often forgotten when it comes to material selection. Surprisingly corrosive! Another great application for s Stainless Steel Unit Heater. Engineered Air EngFlo forced convection finned tube radiation features high capacity in a small profile. Quality aluminum tangential blowers provide forced convection for those high heat loss areas. Engineered Air's rugged 16 gauge (1.5mm) construction is standard in our two units, EF-50, 50" (1270mm) and EF-100, 100" (2540mm). The EF-100 consists of (2) 50" (1270mm) covers and (1) 100" (2540mm) base unit. Engineered Air EngFlo units can be mounted in a variety of different arrangements; wall mounted, floor mounted, ceiling hung, free standing and recessed in wall or floor. Custom configurations and materials are also available. 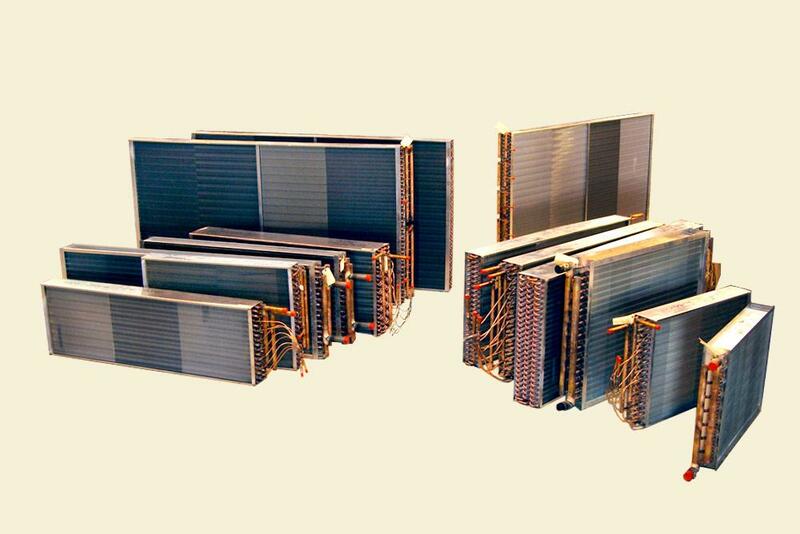 Engineered Air high performance heat transfer coils have found wide acceptance in heating, cooling, dehumidification and heat reclaim applications, ranging from schools, churches, hospitals and high rise buildings to gas plants and manufacturing facilities. 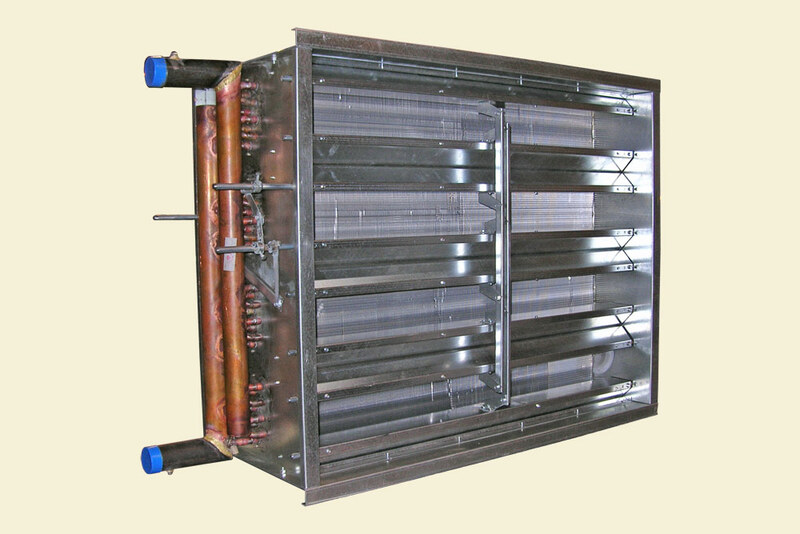 Engineered Air heat reclaim coils utilizing glycol or refrigerant provide substantial savings each year to owners of computer rooms, supermarkets, industrial process plants and other applications. Steam coils are available in standard and "steam distributing" configuration, in both 5/8" and 1" diameter tubes. Engineered Air is proud to be able to provide replacement coils duplicating virtually any type of coil, regardless of make, age, materials, construction or dimensions. Performance is guaranteed and deliveries are fast. Engineered Air has developed computer programs for the selection of hot water, chilled water, steam, refrigerant and heat reclaim coils. These advanced programs can quickly and accurately optimized coils selections by providing a choice of several coils to satisfy load requirements and system design parameters. The broad flexibility inherent in the computer programs allows selection decisions based on initial versus operating costs. Customer assistance is provided by a staff of trained sales people located in Engineered Air offices across Canada and the United States. Pressure testing tanks are but one of the various inspection stages each coil undergoes prior to shipment. Visual and dimensional checks are performed during and dimensional checks are performed during assembly and upon completion to verify manufacturing accuracy. All coils are visually checked before being subjected to a final pressure test at 300psi under water, to insure compliance with required working pressures. All resale coils bear CSA certification for Canada and the USA and catalog data provides ARI certified ratings for 5/8 water coils. Engineered Air is registered to meet the requirements of the CSA B51 Pressure Vessel Code. Unit Ventilators are made by the Heat Transfer Division of Engineered Air in four basic models, all in either draw through or blow through coil configurations. The 4 models are traditional vertical, horizontal ceiling, single fan horizontal ceiling and floor to ceiling riser style. All models are available with self-contained DX cooling and/or Heat Recovery options. 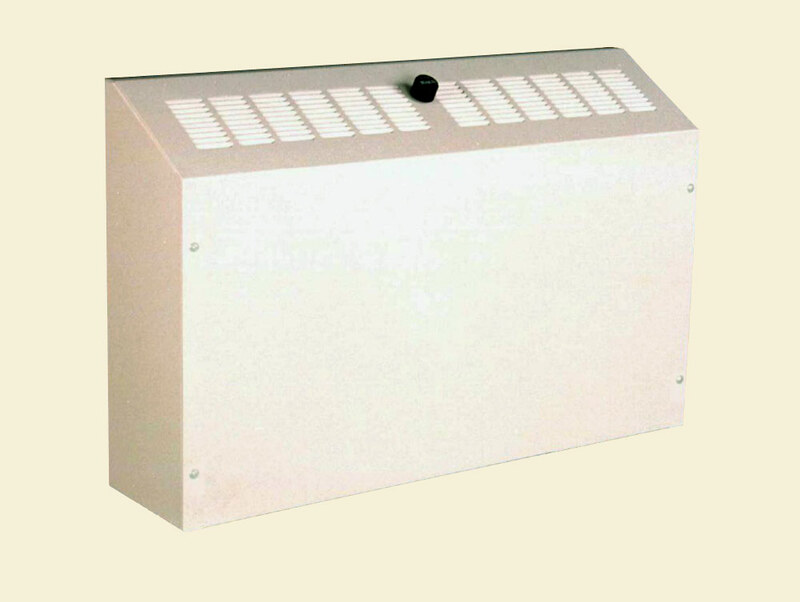 The VUV Series unit ventilator with its traditional arrangement is well known. 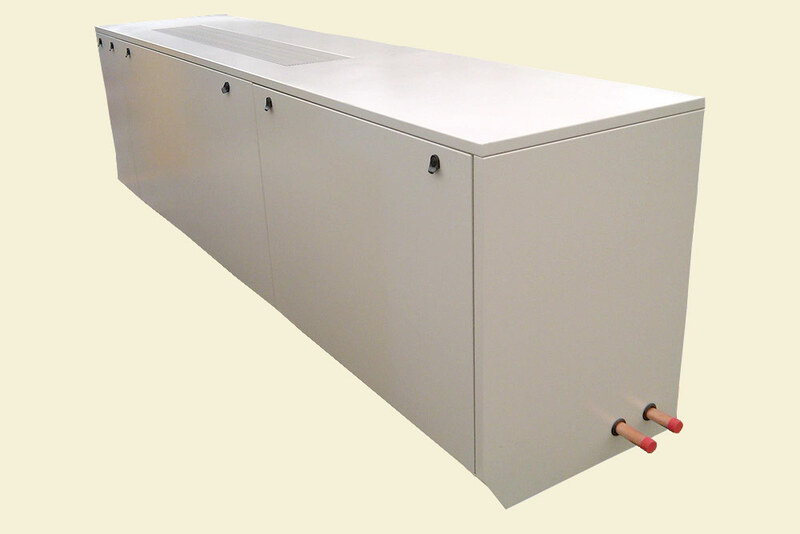 Engineered Air brings a breath of fresh air to older buildings with our custom, built to fit replacement units. All models are capable of 0 to 100% outside air. 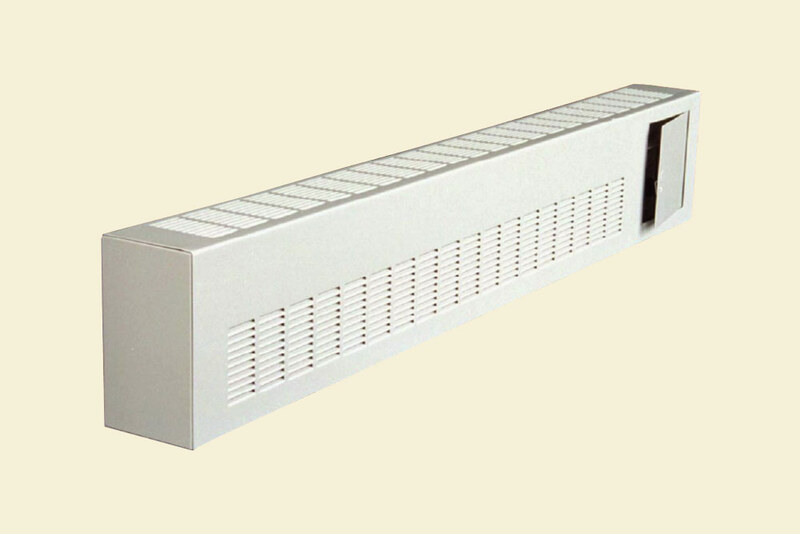 The VUV is typically floor mounted on an exterior wall where fresh air is readily accessible. 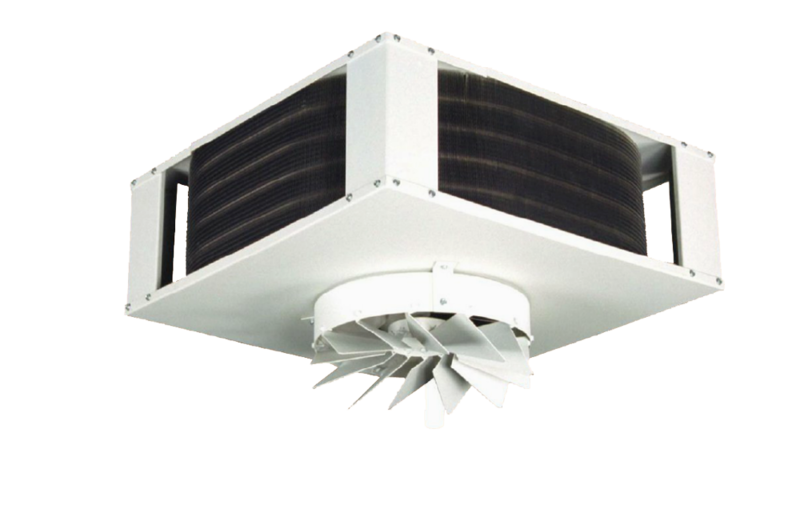 The SUV Series single fan ceiling mounted unit ventilator may be just what you need. The linear arrangement could solve that tight ceiling problem. The 14 gauge fan board and full 1’ acoustic insulation, standard on all Engineered Air unit ventilators, insures quiet operation. 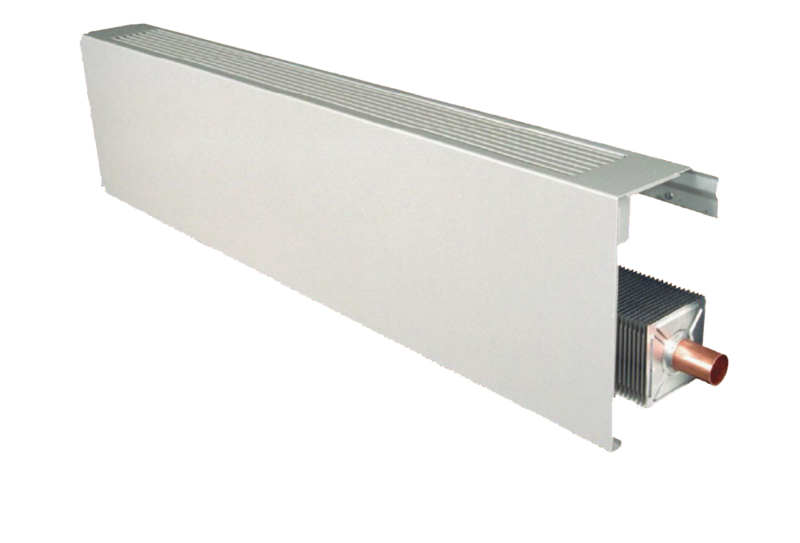 Recessed installations have bottom access with optional hinged doors. For fully concealed SUV units, side access is recommended. The small footprint of the RUV Series means more usable floor area. With vertical up and down flow, blow through and draw through models, Engineered Air has an arrangement for every situation. The RUV base height is adjusted to suit any floor to ceiling dimension. All Engineered Air unit ventilators features sloped stainless steel drain pans for positive condensate removal and long life. Lateral discharge ducts of rugged 16 gauge steel can be provided for down flow units. 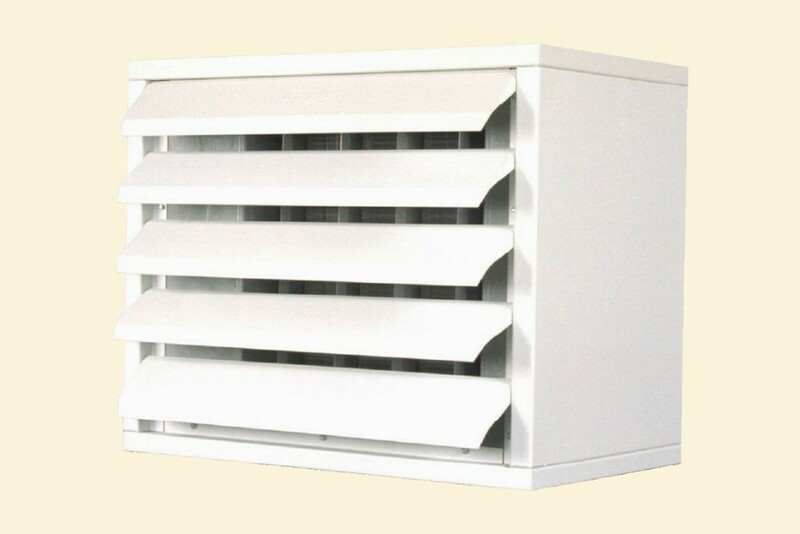 Lateral ducts have integral pencil proof louvres and are available in matching colours. The HUV Series unit ventilator for concealed or exposed ceiling installations rounds out our family of unit ventilators. The HUV can be installed exposed (below the ceiling), flush mounted or concealed. All of our unit ventilators can be supplied with your choice of steam, water or electric heating coils and DX or water cooling coils. Duct discharge or integral grilles are available. Engineered Air can also provide any of the models with self-contained DX cooling. 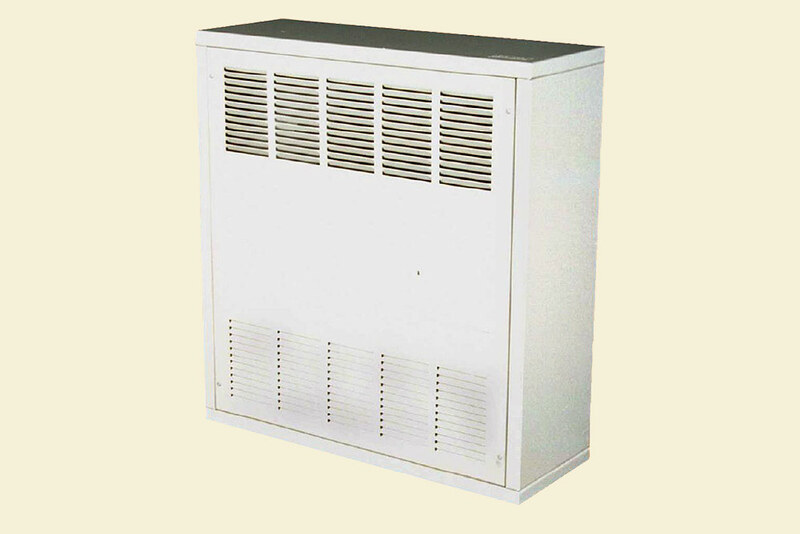 This eliminates the need for outdoor condensing units that are subject to vandalism and damage. Using quiet and efficient scroll compressors provides cooling in areas that are occupied year round and allows the central plant to be shut down during idle times. Heavy duty 16 gauge (1.5mm) steel cabinet. The first HERESITE coating application to the exterior surfaces of finned tube coils took place in the early 1950s. Since that time the HERESITE baking phenolic coating has effectively demonstrated its value in protecting heat transfer coils from corrosive attack, thereby appreciably increasing equipment service life. The excellent chemical and temperature resistance coupled with the good heat transfer properties of the HERESITE coating have made possible the outstanding results being obtained. Engineered Air, in searching for corrosion resistant coating for finned tube heat transfer products, realized that HERESITE baked phenolic resins were far superior to any other type of coating on the market, both in terms of heat transfer characteristics and resistance to corrosive attach from an extremely wide range of chemicals. HERESITE is the registered trademark for pure phenol-formaldehyde thermosetting resinous coatings. The HERESITE coating applied to finned tube coils is the P-413 Flexible Brown Baking Phenolic Coating. This coating is applied to either aluminum, copper or steel with equal results. We feel it is important to emphasize that HERESITE baking phenolic coatings are manufactured and sold only by HERESITE PROTECTIVE COATINGS INC. Further, the application of the HERESITE baking phenolic coating to finned tube coils is performed at the HERESITE plant in Manitowoc, Wisconsin, USA, at Engineered Air in Calgary, Alberta, Canada and at other authorized facilities. Practically all typed of finned tube coils used for oil, water, air, gas and process cooling (and heating) as well as a large condensing coils can be HERESITE protected against damaging environments. Currently, the HERESITE coating of air-conditioning and industrial process coils exposed to corrosive fumes and salt atmosphere is in the increase, with many new applications being found. HERESITE coating offers a more economical solution that special metals for these applications. Typically, aluminum fin coil coated with HERESITE are more economical than copper fin coils. Special metal casing materials are unnecessary since the HERESITE coating is applied to the casing as well as to the finned tubes. Additionally, HERESITE coated aluminum fins will resist attack from most cleaning agents more successfully than copper fin coils. The HERESITE coating of finned tube coils is accomplished by a multiple coat application of dipping and baking resulting in complete coating coverage of the fins, tubes, headers, casings, etc. Consequently, protection against corrosion is provided for the entire coil. Due to specialized surface preparation techniques plus the good adhesive properties of the HERESITE P-413 coating, it is possible to efficiently HERESITE coat all the usual metals used in fabricating finned tube coils. Heating cold outside air with steam or a hot fluid is a risky business at the best of times; there is always a potential for a freezeup! But with steam of hot water, there is nothing better than Engineered Air's LAMIFLO Integral Face and Bypass Heating Coils. In the more Northern climates, with a significant number of hours per year under 32°F (0°C) outdoor air temperature, Engineered Air does recommend the use of glycol solution instead of hot water, particularly in areas where power failures are prevalent. Full flow is sent through the coil at all times, preventing freezeup. Temperature control is maintained by a series of Face and Bypass Dampers, spaced evenly over the face of the LAMIFLO. Face dampers are employed on both the entering and eliminate unwated heat pickup. The use of LAMIFLO Face and Bypass Dampers for makeup air applications has a very distinct advantage over valve control. A coil is selected for the very worst condition possible - and then often oversized. When the outdoor air temperature is much warmer than the design point, but still below freezing, a control valve is often oscillating between cracked open and fully closed. In one of those fully closed moments, it doesn't take long to chill and then freeze the stationary fluid in the tubes. With LAMIFLO Face and Bypass Dampers, the steam or fluid flow is constant during the period that the outdoor air temperature is below freezing. Temperature control is achieved by metering the incoming cold air through multiple narrow heating and bypass channels to mix at the control temperature. The bypass channels have been sized to provide a pressure drop when fully open that is equal to the pressure drop through the coil, or heating channel when fully open, to assure a constant volume of air. The air streams emerging from the narrow channels are LAMINATED and mixing is virtually complete within 36” (0.9m) of the LAMIFLO section. The advantage of LAMIFLO over conventional internal or external face and bypass dampers is clean; the homogenous air temperature mix is far superior, and downstream devices, for example, reheat coils, cooling coils, or humidifiers, need not be spaced a great distance from the LAMIFLO section to retain even velocity loading. Air pressure drop is minimal on LAMIFLO coils. Conventional bypass dampers, with all the bypass air passing over top of the heating coil, create a system effect that demands extra horsepower. Why LAMIFLO Face & Bypass Heating Coils? The Airtex extruded aluminum panels in lengths up to 16' (4877mm) have changed the way North America heats its buildings. Clean durable Airtex Radiant Linear products are great for the hospital, school, laboratory and office. A continuous architectural perimeter band constructed to virtually any panel width from interlocking extrusions. An innovative mechanical bonding technique maximizes heat transfer between copper circulating coils and aluminum extrusions. 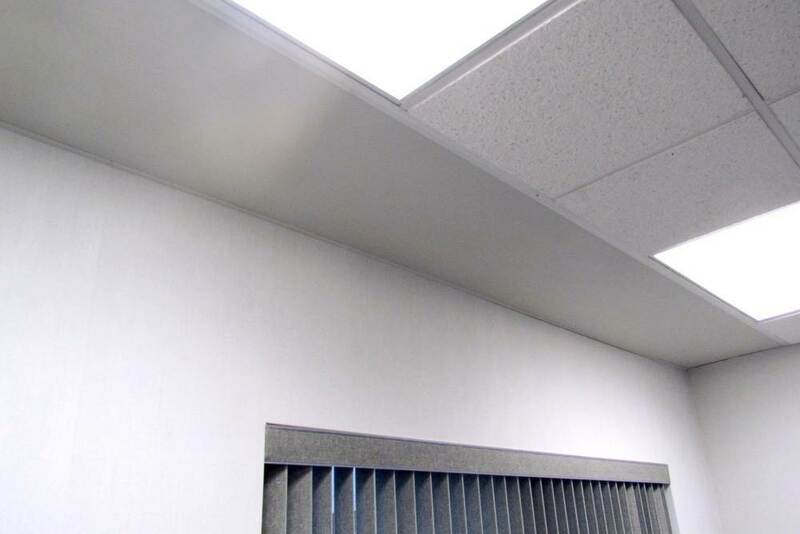 Airtex Modular Radiant Panels fit in standard acoustic ceiling tile grids and can be placed almost anywhere a regular ceiling tile might go. An efficient, patented metallurgical bonding technique between copper coil and aluminum sheet. Panel face can be custom coloured or silk-screened to match acoustic ceiling tile. Durable and efficient AIRTEX Panels provide the necessary wall space, occupant comfort and freedom of maintenance desired in al schools. AIRTEX Systems provide ultimate patient comfort in an aseptic environment, with no maintenance. AIRTEX Systems meet architectural criteria for aesthetics, energy and space efficiency plus easy tenant flexibility. AIRTEX Systems provide a clean, draftless, uniform environment with unlimited use of perimeter space. 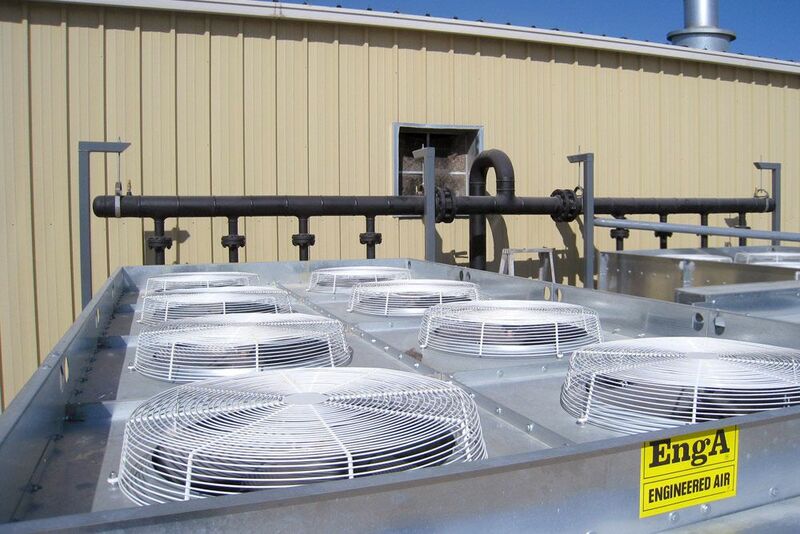 The AF Series Condenser is constructed of heavy gauge galvanized metal selected for long life in outdoor environments. 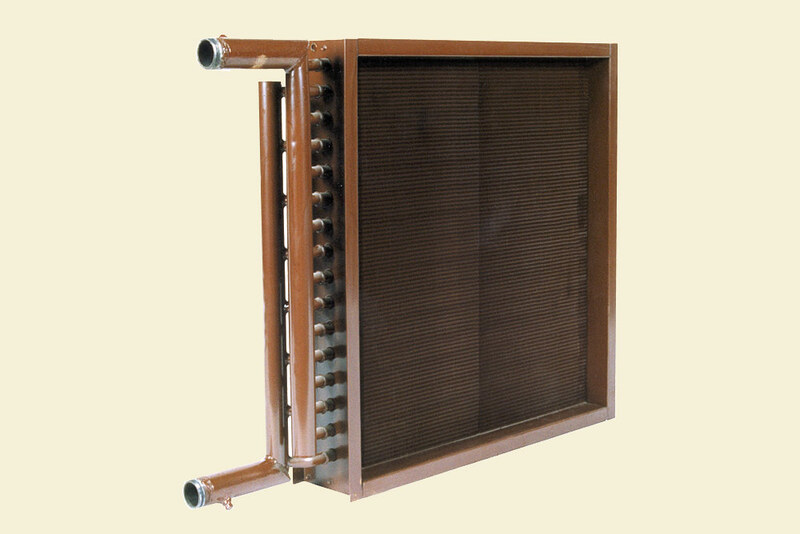 The Condenser coil is of copper tube / aluminum fin construction as standard although other materials are available as an option. Custom circuiting is utilized to provide optimum capacity with minimum pressure drop. Proven components, which have withstood the rigorous test of time, are used in the air moving assemblies. Venturi openings are spun to exacting tolerance to insure maximum airflow with minimum horsepower requirements. All electrical components (standard or optional) are of the highest quality. Cabinets Concealed units shall be fabricated with heavy 18 gauge (1.2mm) satin coat galvanized steel. Exposed units shall be 16 gauge (1.5mm) galvanneal steel and be treated to a multi-step preparation process before the application of an electrostatically applied, baked white powder coat primer. Cabinets shall be lined with 1" (25mm) neoprene coated insulation. Condensate pans shall be stainless steel and be insulated with closed cell insulation for sweat proof operation and corrosion resistance. All units shall come complete with a 1" synthetic disposable filter, as well as being equipped with an electrical junction box. Coils Heating and cooling coils shall be manufactured by Engineered Air and consist of aluminum fins mechanically bonded to 1/2" (13mm) copper tubes. Fins shall be rippled for maximum heat transfer and coil casings shall be galvanized steel. Coils shall be factory tested with air at 300 psig (2070 kPa) while immersed in an illuminated water tank. Fans Double width, double inlet, forward curved centrifugal fans constructed of galvanized steel shall be provided. Fans shall be balanced for quiet, vibration free operation and be supplied with housing specifically designed for efficient airflow. Motors All motors shall be open type, resiliently mounted, incorporating sleeve bearings and internal overload protection. Motors shall be permanent split capacitor type. All motors shall be equipped for 115/1/60 and be capable of at least three speeds. All units shall be safety tested to conform to UL Standard 1995 and CSA.2 No. 236. Units shall be CSA approved and bear the CSA label. Units shall be Engineered Air series HFC (horizontal blow thru), VFC (vertical blow thru), or LFC (lowboy blow thru) with model, sizes, capacities, motor types, H.P. (kW) and power characteristics as indicated on drawings and/or schedules. Cabinets Casing shall be constructed of 18 gauge (1.3mm) unpainted satin coat galvanized steel. Units shall include 1" (25mm) 1 1/2" lb/ft^3 (24 kg/m^3) insulation, integral stainless steel drain pan, slotted hanger channels, duct collars on inlet and outlet, screwed access panels, adjustable motor mounts and 2" (50mm) throwaway filters. Unit construction is one piece. Units are factory tested. Field assembly of components, including mounting of motor and drives is not acceptable..
Coils Heating and/or cooling coils shall be 1/2" (13mm) copper tube with rippled aluminum fins and Schraeder vent fittings on fluid coils. D.X. coils shall include distributors. Expansion valves and refrigeration accessories are by refrigeration contractor (others). Units shall be Engineered Air model JM (draw through), JMV (vertical draw through), or MT (blow through) with model number, sizes, capacities, motor types, H.P. (kW), and power characteristics as indicated ond rawing and/or schedules.